BACKGROUND AND PURPOSE: Endovascular trials suggest that revascularization benefits a subset of acute ischemic stroke patients with large-artery occlusion and small-core infarct volumes. The objective of our study was to identify thresholds of noncontrast CT–ASPECTS and collateral scores on CT angiography that best predict ischemic core volume thresholds quantified by CT perfusion among patients with acute ischemic stroke. MATERIALS AND METHODS: Fifty-four patients with acute ischemic stroke (<12 hours) and MCA/intracranial ICA occlusion underwent NCCT/CTP during their initial evaluation. CTP analysis was performed on a user-independent platform (RApid processing of PerfusIon and Diffusion), computing core infarct (defined as CBF of <30% normal). A target mismatch profile consisting of infarction core of ≤50 mL was selected to define candidates with acute ischemic stroke likely to benefit from revascularization. RESULTS: NCCT-ASPECTS of ≥9 with a CTA collateral score of 3 had 100% specificity for identifying patients with a CBF core volume of ≤50 mL. NCCT-ASPECTS of ≤6 had 100% specificity for identifying patients with a CBF core volume of >50 mL. In our cohort, 44 (81%) patients had an NCCT-ASPECTS of ≥9, a CTA collateral score of 3, or an NCCT-ASPECTS of ≤6. CONCLUSIONS: Using an NCCT-ASPECTS of ≥9 or a CTA collateral score of 3 best predicts CBF core volume infarct of ≤50 mL, while an NCCT-ASPECTS of ≤6 best predicts a CBF core volume infarct of >50 mL. Together these thresholds suggest that a specific population of patients with acute ischemic stroke not meeting such profiles may benefit most from CTP imaging to determine candidacy for revascularization. The objective of our study was to identify thresholds of NCCT-ASPECTS and collateral score on CT angiography that best predict ischemic core volume thresholds quantified by CTP among patients with AIS. The population examined was previously studied in a report of the relative predictive value of quantitative and qualitative acute stroke imaging analysis in prognostication and clinical outcome prediction.10 Briefly, 62 continuous patients (36 women; median age, 70 years; range, 33–94 years) with AIS (<12 hours) and MCA or intracranial ICA occlusion were identified from a prospectively collected, single-institution stroke registry and radiologic informatics query of 815 patients with ischemic stroke, spanning February 1, 2011, to December 31, 2013, with Emory University Hospital review board approval. All patients were evaluated initially by a dedicated vascular neurologist in the emergency setting, with initiation of institutional stroke protocol facilitating expedited triage, imaging, interpretation, and treatment when appropriate. All patients underwent comprehensive stroke imaging at presentation, including NCCT, CTA, and CTP. Patients were included in the analysis on the basis of successful completion of the imaging protocol, absence of motion or other artifacts rendering imaging nondiagnostic, and the absence of large hemorrhages such as parenchymal hematomas (types 1 and 2) potentially confounding final infarction measurement. Exclusion criteria were an inability to undergo multimodal CT, a history of renal failure, and patient age younger than 18 years. A subset of patients received intravenous and/or intra-arterial thrombolytic therapy as per institutional protocol and at the discretion of the treating vascular neurologist and neurointerventionalist. All patients underwent an institutional stroke imaging protocol including NCCT, CTP, and CTA. CT was performed on a 40-mm, 64–detector row clinical system (LightSpeed VCT; GE Healthcare, Milwaukee, Wisconsin). Helical NCCT (120 kV[peak], 100–350 auto-mAs) was performed from the foramen magnum through the vertex at 5.0-mm section thickness. In the absence of visible intracranial hemorrhage during real-time evaluation by a radiologist and stroke neurologist, 2 contiguous CTP slabs were obtained for 8-cm combined coverage of the supratentorial brain, obtained at 5-mm sections per slab. Cine mode acquisition (80 kVp, 100 mAs) permitting high-temporal-resolution (1-second sampling interval) dynamic bolus passage imaging was performed following the administration of 35 mL of iodinated contrast (iopamidol, Isovue 370; Bracco Diagnostics, Princeton, New Jersey), power injected at 5 mL/s through an 18-ga or larger antecubital IV access. Contrast administration was followed by a 25-mL saline flush at the same rate. For both slabs, the same acquisition and injection protocol was used (ie, a total of 70 mL of iodine was used for CTP). Last, helical CTA (120 kVp, 200–350 auto-mAs) was performed from the carina to the vertex (section thickness/interval, 0.625 /0.375 mm) following IV administration of 70 mL of iodinated contrast injected at 5 mL/s and followed by a 25-mL saline flush. A CTA-derived collateral vessel-scoring methodology was used as detailed previously.10,12 Briefly, 2 experienced neuroradiologists, both with subspecialty certification and experienced in stroke and neurovascular imaging, assigned CTA collateral scores using a visual inspection methodology to quantify surface leptomeningeal collaterals in response to proximal arterial compromise, compared with the contralateral side.12 The neuroradiologists assigned scores blinded to clinical and outcomes data and all other imaging.13,14 A collateral score was assigned by using an ordinal, visual grading system estimating collateral flow, scored 0–3 as follows: Collateral flow was assigned a score of zero for absent surface vasculature, 1 for >0 but ≤50% vasculature, 2 for >50 but <100% vasculature, and 3 for normal or supranormal surface vasculature of the MCA territory. CTA analysis was performed by using 20-mm axial sliding maximum intensity projection and 0.625-mm axial source images and orthogonal and curved multiplanar reformats as needed. Cerebral blood flow maps expressed in milliliters/100 g/minute were computed as outlined elsewhere. Relative CBF maps have been used in the stroke trial setting as estimates of irreversibly infarcted (core) tissues by using thresholds of relative CBF of <30% contralateral normal tissues.16 Parametric maps were automatically generated and overlaid on source images for review purposes. An operationally defined CTP profile predicting favorable outcome was assigned as prescribed in a recently reported, prospective endovascular therapy trial.5 Specifically, a target mismatch profile consisting of an infarction core of ≤50 mL was selected as the target relative CBF infarction core volume determined across NCCT-ASPECTS and at a dichotomized NCCT-ASPECTS of ≥7. The 50 mL threshold was selected as a reference volume as reported by the investigators of the recent Solitaire With the Intention for Thrombectomy as Primary Endovascular Treatment (SWIFT PRIME) trial and as used in the recent development of a benchmarking software environment for quality control in stroke perfusion imaging.5,17 The Fisher exact test was further applied to determine the association of ASPECTS of ≥7 and infarction core of ≤50 mL. A prediction error model for correct classification of patients as having greater or less than 50 mL CBF infarction core was determined across NCCT-ASPECTS and at a dichotomized ASPECTS of ≥7. Sensitivity, specificity, and positive and negative predictive values for various thresholds of ASPECTS and collateral scores were calculated and reported. Statistical analysis was performed in R statistical and computing software (http://www.r-project.org/). Sixty-two patients (36 women; median age, 70 years; range, 33–94 years) with AIS (<12 hours) and MCA or intracranial ICA occlusion constituted the study population as previously reported. Incomplete or degraded imaging necessitated exclusion of 8 patients, leaving 54 patients for analysis. An ICA or M1 occlusion was present in 41 (76%) patients, with proximal M2 segment occlusion in the remainder. No patients had bilateral arterial occlusions. As shown in Table 1, the median NIHSS score at admission was 15 (interquartile range, 16); the mean duration from the time of onset/last known healthy to imaging was 210 minutes. Twenty-three (43%) patients received IV tPA, and 9 (17%) underwent endovascular treatment with intra-arterial tPA (n = 3) or thrombectomy (n = 6). 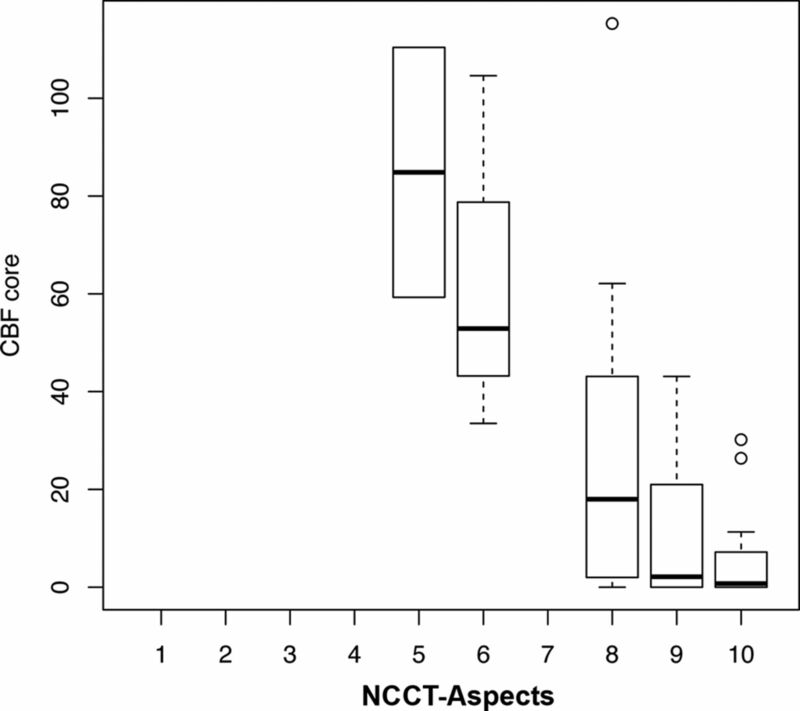 The median NCCT-ASPECTS was 9 (interquartile range, 1). Median final infarction volume as measured by MR imaging was 37 (interquartile range, 96) mL. While a significant association was detected between CBF core estimates and NCCT-ASPECTS (Kendall τ correlation, −0.51; P < .01), large variability was found across 2-reader mean ASPECTS values (Fig 1). For example, across patients with an NCCT-ASPECTS of 8, the CBF core volume ranged from 0 to 115 mL with a median of 23 mL (interquartile range, 42 mL). Ranges of core volume increased further at lower ASPECTS. Table 2 presents sensitivity, specificity, negative predictive values, and positive predictive values of the candidate predictors, NCCT-ASPECTS and collateral scores. For the analysis of dichotomized ASPECTS of ≥ 7, the CBF core volume ranged from 0 to 115 mL with a median of 4 mL (interquartile range, 15 mL). An NCCT-ASPECTS of ≥9 had 100% specificity (95% CI, 60–100) for identifying patients with CBF core volume of ≤50 mL, while an NCCT-ASPECTS of ≤6 had 100% specificity (95% CI, 90%–100%) for identifying patients with a CBF core volume of >50 mL. The prediction error model for correct identification of infarction core of ≤50 mL among ASPECTS of ≥7 demonstrated significant associations but low specificity relative to a CBF core of ≤50 mL (prediction error, 9%; P = .025; sensitivity, 0.98; specificity, 0.50; negative predictive value, 0.80; positive predictive value, 0.92). Our cohort included 28 patients with a collateral score of 1, 10 patients with a score of 2, and 15 patients with a score of 3. A collateral score of 3 on CTA had 100% specificity (95% CI, 47%–99%) but only 33% sensitivity (95% CI, 20%–49%) for identifying patients with AIS with a CBF core volume of ≤50 mL. A collateral score of ≤1 had an 88% sensitivity (95% CI, 47%–99%) and a 53% specificity (95% CI, 38%–68%) for identifying patients with AIS with a CBF core volume of >50 mL. The collateral score demonstrated a significant association with CBF ischemic core volumes (P < .01). Our study found significant variability in CBF core volumes among patients with AIS with similar NCCT-ASPECTS, we identified thresholds of NCCT-ASPECTS of ≥9 and collateral scores of 3 with high specificity for finding patients with AIS with core volumes considered ideal for revascularization. We also found that NCCT-ASPECTS of ≤6 had a high specificity for identifying patients with AIS with core volumes that made them suboptimal candidates for revascularization. Recent successful AIS trials have used disparate methodologies for patient selection. These have differed primarily in their use of either fast but potentially insensitive methodologies (eg, NCCT-ASPECTS) versus more rigorous approaches to estimating tissue viability with CTP, permitting operational tissue classification, segmentation, and volume measures.3,4,7,18 These specific factors have been emphasized as targets for optimization and general requirements in the stroke-research setting in recent expert consensus.19 NCCT-ASPECTS aims to qualitatively identify early ischemic changes modulated by ischemic bulk water shifts (ie, edema). The speed and nearly invariable access to NCCT-ASPECTS are clearly advantageous; however, reproducibility and interrater agreement are reportedly variable.11,20⇓–22 The insensitivity of NCCT to initial water shifts, primarily those from the interstitial to the intracellular compartment preceding progressive vasogenic edema, may preclude accurate estimation of neuronal injury in the very early aftermath of infarction.14,20⇓⇓–23 NCCT-ASPECTS may furthermore be limited by its tendency to cluster largely variable volumes of injury across its coarsely changing scale, as illustrated in Fig 2, in which identical NCCT-ASPECTS between 2 subjects can belie considerable differences in the actual volume of injury. Such challenges may underlie existing reports of greater agreement and predictive accuracy for CTP in comparison with NCCT-ASPECTS.13,14,24,25 Notwithstanding these features, we previously reported a high interrater agreement in the assignment of dichotomized ASPECTS of >7, despite more marginal agreement across all ASPECTSs. Patient selection criteria likely modulate success in achieving a favorable clinical response following revascularization in acute ischemic stroke. The era of contemporary revascularization technologies now permits timely and dependable restoration of flow in most cases; however, optimal identification of a target population for treatment remains critical, and the ideal selection strategy remains inconclusively established. These findings suggest that readily available and expedited approaches to selection such as ASPECTS correlate with commonly used perfusion parameters but may lack sensitivity to inform accurate and quantitative estimations of core volumes. Using an NCCT-ASPECTS of ≥9 or a CTA collateral score of 3 best predicts a CBF core volume infarct of ≤50 mL, while an NCCT-ASPECTS of ≤6 best predicts a CBF core volume infarct of >50 mL. Together these thresholds suggest that a specific population of patients with AIS not meeting such profiles may benefit most from CT perfusion to determine their candidacy for revascularization. Disclosures: Matus Straka—UNRELATED: Employment: iSchemaView; Stock/Stock Options: iSchemaView. Srikant Rangaraju—UNRELATED: Grants/Grants Pending: National Institutes of Health,* Comments: Dr Rangaraju is a trainee under the National Institute of Neurological Disorders and Stroke T32 training grant (2T32 NS 007480-15, Principal Investigator, Allan I. Levey). *Money paid to the institution. Accepted after revision January 10, 2016.